The first of 4 vols. 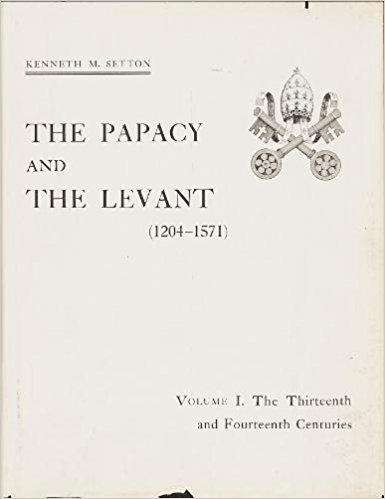 which trace the history of the later Crusades & papal relations with the Levant from the accession of Innocent III (in 1198) to the reign of Pius V & the battle of Lepanto (1566-71). From the mid-14th cent. to the conclusion of his work the author has drawn heavily upon unpub. materials, collected in the course of 17 trips to the Archivio Segreto Vaticano & the Archivi di Stato in Venice, Mantua, Modena, Milan, Siena, & Florence, & the Archives of the Order of the Hospitallers at Malta. 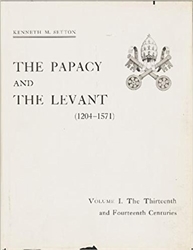 In addition to a history of the later crusades (to the year 1400), the book deals in passing with various items -- crusading propaganda, the postal service of the 14th cent., ecclesiastical & feudal lawsuits, social conditions in papal Avignon, & even fashions in footwear.